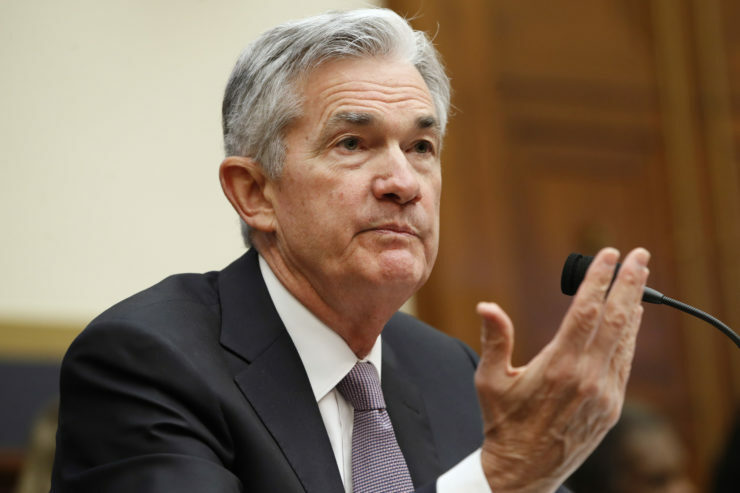 Federal Reserve Chairman Jerome Powell gestures Tuesday while he testifies to the House Financial Services Committee. Members of the U.S. House Financial Services Committee grilled the new chairman of the Federal Reserve about racial disparities in lending earlier this week, citing an analysis by Reveal from The Center for Investigative Reporting. It was Jerome H. Powell’s first appearance before Congress since succeeding Janet Yellen on Feb. 5. Rep. Lacy Clay, a Democrat from Missouri, presented Powell with Reveal’s findings on St. Louis, where black applicants were 2.5 times as likely to be denied a mortgage as their white counterparts. What would he do to treat all applicants fairly and punish banks, Clay asked. Based on millions of records available under the Home Mortgage Disclosure Act, Reveal identified 61 metro areas across the country where people of color were significantly more likely to be denied a conventional home loan. That was true even after considering an applicant’s income, the size of the loan, and the economic and racial breakdown of the neighborhood where they wanted to buy. Rep. Keith Ellison, a Democrat from Minnesota who serves as deputy chairman of the Democratic National Committee, requested that Reveal’s reporting be entered into the Congressional Record. Under questioning from Ellison, Powell said that the economic impact of denying people who qualify for a mortgage could be immense. Powell also was asked to elaborate on his position on the Trump administration’s efforts to soften the Community Reinvestment Act, a 40-year old law that requires banks to solicit clients – borrowers and depositors – from all segments of their communities. He said that he has not yet taken a position on how to best update the act and needed time to review the current process. Earlier this month, the comptroller’s office met with members of the American Bankers Association to get their recommendations about how the act should be changed. A report the bankers association submitted in December complained of “overly restrictive concepts of community and economic development” under the law. The Federal Reserve is one of three government agencies that enforce the Community Reinvestment Act, inspecting banks to ensure they take steps to lend in low-income neighborhoods and to low-income borrowers. Rep. Gregory Meeks, a Democrat from New York, said that the CRA needed to be updated but expressed concern that a bank’s history of documented discriminatory practices might not factor into its CRA review under the administration’s proposal.